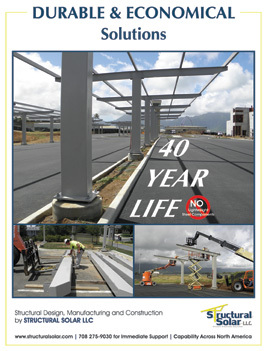 Structural Solar LLC, a leading design-build company who specializes in economical solar carports for institutional, municipal and commercial solar installations has announced that it has extended its product offering and management services to providing economical structural ground mount solar structures. Structural Solar designs and builds ground mount solar structures that are designed to be maintenance free and the lowest cost structures available in the US market. Structural Solar designs, manufactures and installs structural ground mount solar structures across North America. The companies engineering team can provide signed and sealed drawings for any state across the country. In its principal market, structural carports, the Company has developed a reputation for quality service, cost effective design and manufacturing and construction based on highly efficient and technical means and methods. Structural Solar approaches each project with fresh perspective. The company manages the geotech work and determines the most cost effective foundation design to support its ground mount structures. Structural Solar specializes in driven pile, helical pile and drilled pier foundations. Structural Solar LLC provides efficient structural solutions to solar developers. The company utilizes a unique, direct and streamlined sales and estimating process which provides an opportunity for developers to optimize solar arrays, complete strings more efficiently and value engineer their projects. The result is higher quality solar ground mount and carport structures, more satisfied owners and lower cost for the developers. The final ground mount structural design is guided by client specifications but always driven by economics. Structural Solar works seamlessly with leading solar developers to optimize solar installation and control costs for any given scope of work. Providing economical ground mount solar structures is a critical design element. Structural Solar LLC understands that its structures must be economical in order for the project to pencil out for investors. Accordingly, the company often engages its engineers early in the design phase to assess the projects feasibility and examines ways to lower overall cost. For more information about Structural Solar LLC and its ability to deliver high quality, durable and low cost solar ground mount structures, contact Bob Pegnato (708 275-9030) or its website.